I was absolutely over the moon recently when I was asked by Wayfair to join them in a really exciting collaboration with Abigail Ahern. I love Abigail Ahern’s signature dark and moody style. Her trademark inky colour palate combined with lush botanicals and texture, was the inspiration for me to paint my whole house dark three years ago, so as you can guess I was really excited to hear about the collection. In this collaboration with Wayfair, which features a diverse range of products from some top brands, Abigail’s inspiration was the colours of the outback. “Think dark and moody midnight tones with livening accents of burnt sienna and yellow ochre” Texture and pattern feature heavily, along with raw and rustic elements, to produce a collection that is full of character yet surprisingly affordable and absolutely perfect for updating your home for Autumn. I was sent the initial information about the collection and asked to choose 3 of my favourite products to style at home, this you may think would be an easy task. However, when I looked, I realized what an extensive and exciting collection it was, ranging from budget basics to high-end finds. Packed full of statement pieces, opulent lighting, moody artwork and rustic accessories. Featuring materials such as wood, concrete, metal, wicker, leather and cozy textiles such as wool and sheepskin, which is everything I love. Anyway after much deliberation, the first product that stood out to me, was the Lev Wood Metal Side Tables by Woood. I love a side table and think every room should have a few, they are the perfect to pop next to your sofa or chair with a vase of pretty vase of hydrangeeas. 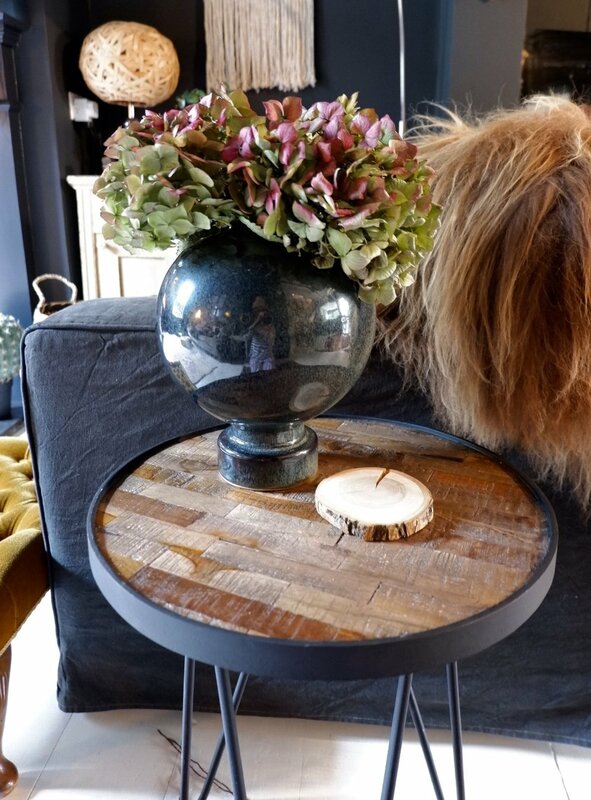 These are a set of two and are a combination of wood and metal with hairpin legs and a beautiful rustic top and have an industrial vibe, which is just what I needed to give my living room an edge. They were really easy to assemble and very robust and a fantastic price. I absolutely love them. The second product was the Do’s Handle Basket Set by The family House. These set of three baskets are handmade from a really thick fibre and weave and are a beautiful, warm and rich colour and are perfect for adding texture and creating a modern rustic vibe to your home. I have filled mine with logs and kindling and the small one is perfect for displaying dried flowers or popping a plant in. Lastly I chose a Hand Crafted Table Vase by Fairmont Park, which I absolutely love. It looks like concrete with a metallic silver glaze and has a raw but glamorous look to it. With it’s large and curved shape it is perfect for placing on the floor with long stemmed dried seed heads to create a rustic autumnal look. 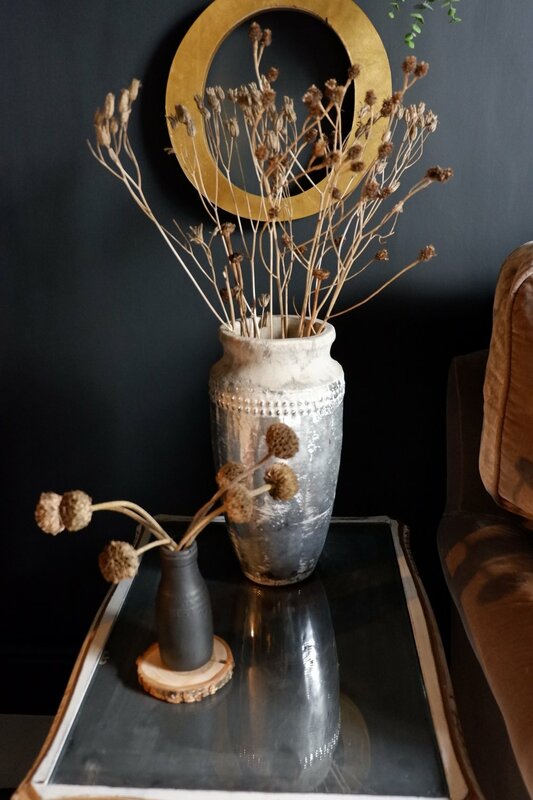 With it’s large and curved shape it is perfect for placing on the floor with long stemmed dried seed heads to create a rustic autumnal look. I have added a link here so you can view the full collection from Wayfair, which, if you love on trend design, you will not be disappointed. Wayfair have very generously offered free shipping with all products in this fabulous collection. I have also created a moodboard of my favourite products to help you out a little, as the collection is so extensive. I really hope you enjoy the collection as much as I have. Finally after reading this post you would like any further help with Styling It Dark, then please check out my services page and contact me. Id love to work with you. *This post is in collaboration with Wayfair but all words are my own.